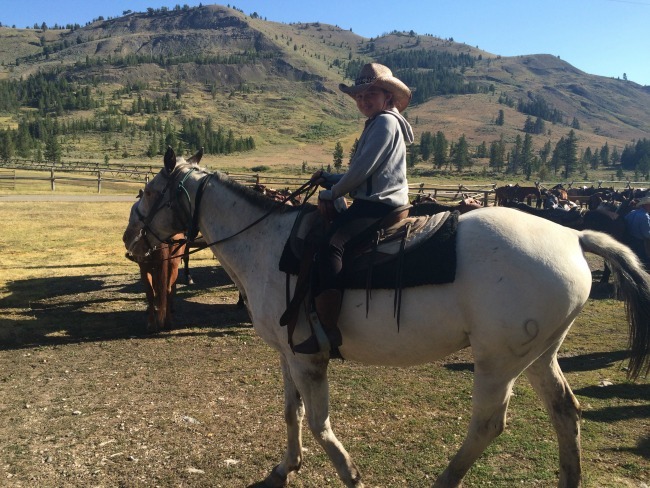 Last summer, we spent 10 days at a dude ranch in Montana. The memories, vivid sights, sounds and smells, have not faded in the last year. If I close my eyes, I can hear the pounding of the horses hooves at dawn as they galloped down the frosty dirt road from their pasture above our cabin. I can feel how quickly the warmth of the sun ran from my face as the sun set behind the mountains. I can see the joy on Jack’s face the first time he was allowed to let his horse run up the trail. No electronics and no schedule beyond the dinner bell, mornings fishing on the river, and two rides a day made for so many moments etched in our family memory bank in such a beautiful setting. Next summer, we’ve all agreed, we’ll go back next summer. So this summer, as our cowboy boots lie in the back of our closets, we’re trying to keep our memories alive. My favorite way to get everyone’s stories flowing is by baking the brownies that were served around the campfire during the sing along night. The light corn syrup gives them a crackly skin, and I cut them small to serve as sweet little bites by our backyard campfire. Who can resist the call of chocolate by the fire? I may not have a herd of appaloosa horses to lure them in, but brownies come close. I’ve tweaked the recipe that was in the Nine Quarter Circle Ranch cookbook, and I keep on tweaking it over time, depending on our mood. My latest creation was the addition of honey roasted peanut butter spoonfuls to the batter just before baking. 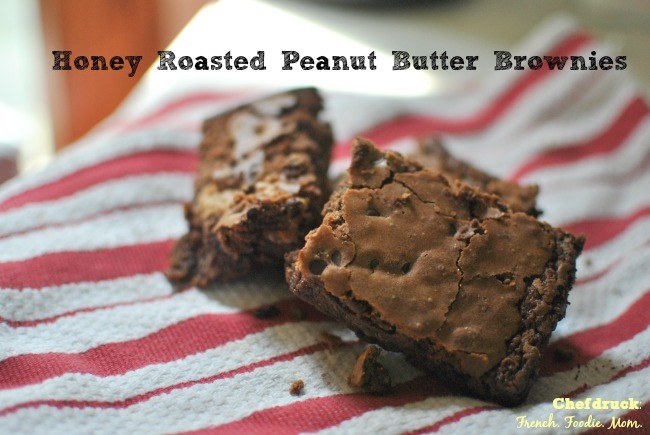 Some pieces have a peanut butter surprise in the middle while others remain more traditional. Something for everyone, just like on the dude ranch. Last I checked, there were still some weeks available at the Nine Quarter Circle Ranch this summer, including a special week dedicated to photography of a special lunar eclipse. 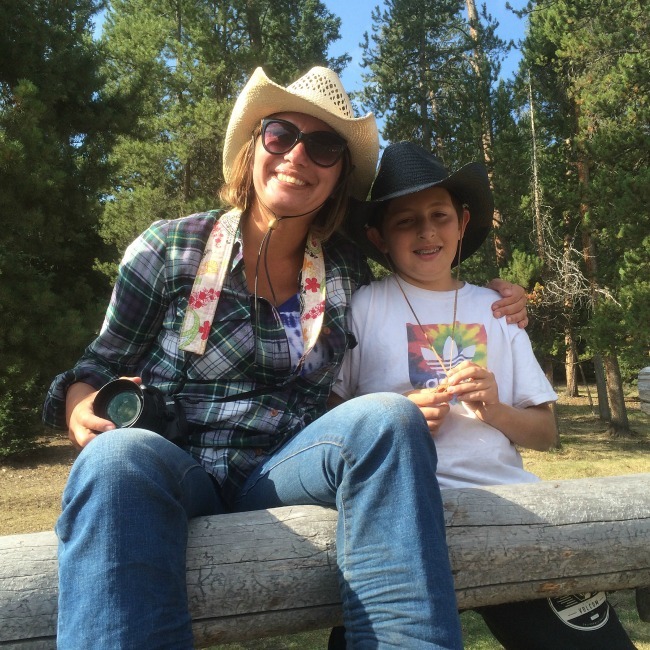 We can’t make the dude ranch happen for our family this summer, but it could work for yours. I promise you’ll make memories for a lifetime. This simple brownie recipe has a nice crunchy skin on top and a mellow chocolate flavor kids and adults love. Preheat oven to 375 degrees Fahrenheit. Grease a 9x13 inch pyrex baking pan. Melt the butter and chocolate in the microwave in a medium microwave safe bowl. First for 60 seconds then for extra increments of 30 seconds until the chocolate is glistening and the butter is all melted. Remove and finish mixing with a dry spoon. Let cool for 5 minutes while measuring the other ingredients. Add the eggs, sugar, corn syrup, vanilla and salt to the melted chocolate. Blend with a hand mixer. Add the flour and blend until just combined. Pour into the pyrex pan. Bang it on the counter a few times to remove any air bubbles. Using a soup spoon, drop chunks of peanut butter evenly throughout the batter. Then dot evenly with the chocolate chips. Cook for 35 minutes until the top is crisp and a toothpick comes out clean.